Scientists at South Dakota State University's Geographic Information Science Center of Excellence have received a $738,000 grant from NASA to study the impact of new energy crops on weather and climate prediction models. The analysis could help biofuel producers and farmers assess weather and wildfire related risks. With increased interest in cellulosic biofuel production, an increasing number of farmers are considering growing high biomass yielding perennial grasses such as switchgrass and miscanthus rather than corn or soybeans for ethanol and biodiesel production. This transition, spurred by the emergence of efficient second generation biofuels, generates a set of factors that can change the seasonal cycle of water and energy exchanges between the land and the lower portion of the atmosphere. For example, perennial grasses use more water in the early stages of their growing season than corn or soybean plants. The three-year study will focus on land use in North Dakota, South Dakota, Nebraska, western Minnesota and northern Iowa. Preliminary results should be available in 12 to 24 months, said Geoffrey Henebry, an SDSU professor and senior scientist at the center. Senior scientist Michael Wimberly said the researchers are not trying to predict exactly what will happen. Their goal is to make some broad but reasonable assumptions about some possible future landscapes and how those may affect the weather. At this point, they do not have any foregone conclusions. Even though they are merely beginning the study, the rationale for the research comes from the observation made in past studies which looked at the interactions of different types of land cover and regional weather, which found that there are a variety of effects. The researchers are operating on the assumption that there will be a fairly heterogeneous mix of different types of crops in the future: traditional first generation crops combined with new energy crops such as grasses. Dried-out grasses are a hot fuel source, and farm machinery could easily provide a spark for ignition. That could become a problem in a region known for its relatively high sustained winds, and not many fire departments have experience in large grass fires, Henebry said. Switchgrass is highly flammable, and grass fires are really fast and furious. Such fires were common in the tall grass prairie thousands of years before European settlement. Wimberly added research could lead to the development of practices to decrease such risks. If the hazards are recognized and understood, then there's a good chance they can be managed and mitigated, the researcher said. The idea is to get out ahead of the curve and try to envision some of these things rather than being in a reactive mode somewhere down the line after they become a problem. The Geographic Information Science Center of Excellence (GIScCE) is a joint collaboration between South Dakota State University (SDSU) and the United States Geological Survey's National Center for Earth Resources Observation and Sciences (EROS). The purpose of the GIScCE is to enable South Dakota State University faculty and students, and EROS scientists to carry out collaborative research, seek professional development, and implement educational programs in the applications of geographic information science. 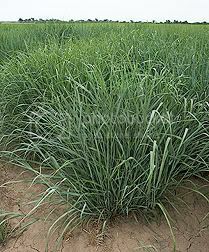 Picture: Switchgrass as a biofuel and bioenergy crops. Credit: Stephen Ausmus. South Dakota State University: Geographic Information Science Center of Excellence. Ethanol Producer Magazine: NASA-funded study may help biofuels producers - February 5, 2008. Minnesota Public Radio: NASA-funded study to examine crops' effect on weather - February - February 4, 2008.